You can create a segment based on a pixel. 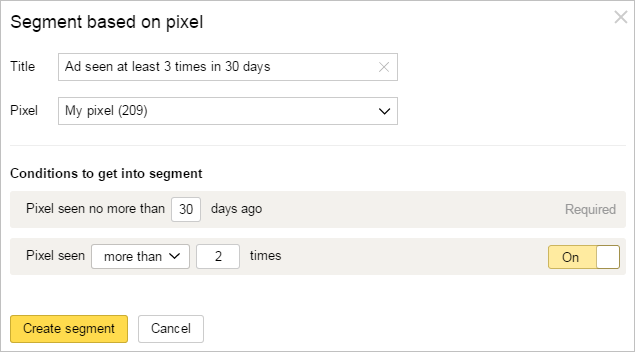 In the Segments tab, click the Create segment button and choose Based on Yandex data → Yandex.Audience pixel. Enter the name of the segment and choose the pixel. Specify the period from 1 to 90 days. The segment will include anonymous IDs of the users who viewed promotion materials containing the pixel during the specified time. Additionally, you can specify how many times the user has to view promotion materials during the specified period. The segment you create will be assigned the “Processing” status. Processing can take up to 2 hours. If the audience coverage is at least 1,000 anonymous IDs, the segment gets the “Finished” status. You can now use it to configure your ads.